I hear many folks talking about the founders of ISIS and they say that USA created it to make chaos in the Arabic countries. "In effect the United States created ISIS, nothing like it existed before the American occupation. We created it, it's ours, and now we are trying to deal with the consequences." These criminal organizations – including al-Qaeda, DAESH and the like – were created with the purpose of pitting us against one another and making nations confront each other. “They’ve created Isis. Hillary Clinton created Isis with Obama,” Trump said. Some interpretations of this question are highly opinion-based and can't be answered on this website (try Quora), but others can be factually answered. Are the leaders of ISIS Americans? Did American politicians meet with ISIS? No, such images were mislabeled; see this question. Did Obama claim to be training ISIS? No, this was a misstatement. Are there leaked documents, namely from Edward Snowden, that say that U.S. and Israel conspired to create ISIS? No, this is an online hoax. Did a 2012 United States government document claim that a Salafist state in Syria would be "exactly what the supporting powers to the opposition want, in order to isolate the Syrian regime" and that the creation of such a state is a "possibility"? Did the CIA route funds and weapons through the Salafist Saudi Arabian government in 2013 to unspecified "rebels" in Syria? Were the "rebels" that the CIA was funding through Saudi back channels Salafist themselves, or was Saudi Arabia helping to bring moderate democracy to the Middle East? Was the US creating/funding ISIS? Has the US government intended to "make chaos in the Arabic countries"? It was their open position in 2011-2015 that Assad needed to step down, which included the covert and open training of anti-Assad rebels, (source) but whether this constitutes a desire for "chaos," or if there are more sinister secret motives, is a matter of individual opinion. An additional point, suggested in the comments: most people would hold the US responsible for the 2003 Iraq War and the mismanagement of the country that followed, in which Islamist groups came to power. Whether this constitutes "creating ISIS" is again a matter of personal opinion. Also suggested in the comments: ISIS has picked up a lot of weapons and technology left behind by American-backed groups such as the Iraqi army. Amnesty International claims that most of ISIS' weapons were acquired this way (source). Again, it's arguable whether this amounts to "creation", but it can add to a possible case. In short, we have no damning evidence that the US created ISIS; we have solid information that the US was involved in Syria from an early period, but connecting this to ISIS requires conjecture and opinion-based statements. This question was edited to include al-Qaeda. The US has been in a relationship with al-Qaeda since its very beginning during the Soviet–Afghan War, and the CIA is currently arming al-Qaeda's allies, but in the long run the relationship has been more antagonistic. We lack evidence that the US had influence over al-Qaeda at the time that ISIS formed and broke off from it. It depends on what aspect of the question you are focusing on. Did the USA create ISIS? Largely, yes, they did. Did the USA create ISIS for the purpose of creating chaos? No, not at all. They created ISIS out of sheer incompetence and lack of foresight. tldr They went out of their way create a situation where they knew this could be the result, ignored warnings and experience that indicated it would be the result, helped the situation along, then realized that this 'solution' was worse than the problem. I don't think anyone can reasonably say that the USA isn't largely responsible for the existence of ISIS. They made a bunch of bad choices, and things snowballed out of control. But to reiterate, the fact that they are bombing ISIS now, shows that this wasn't the planned end goal. It got out of hand. I'd recommend people actually watch and/or read the argument being made by Mark Danner (and that the OP is asking about). He isn't talking about some 'grand conspiracy' that way people here seem to be assuming and writing answers about. It is true that the US invasion of Iraq favored the creation of ISIL (great explanation) but to trace it's real origin we have to look back further in time, we have to take a look at the Afghanistan war. 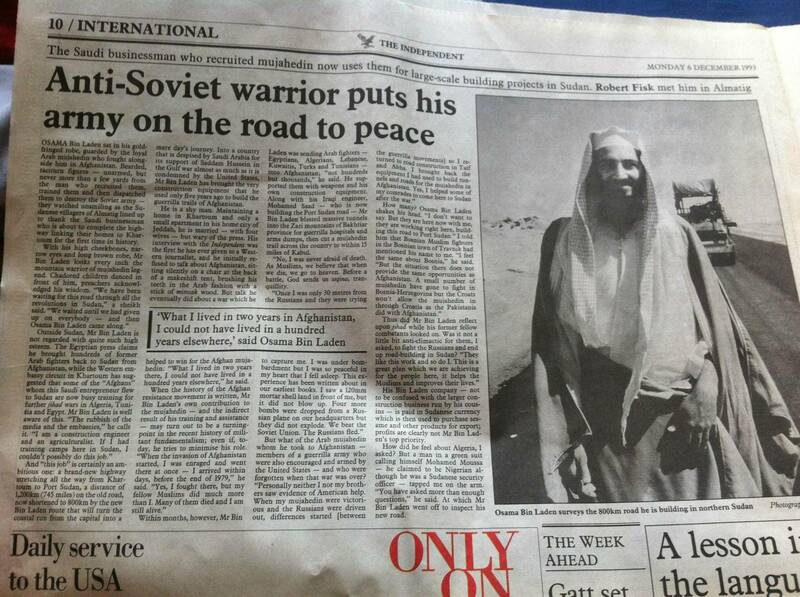 United States financed terrorist groups, the Mujahideen, back in Afghanistan 1979    in their "crusade" against USSR communists. Near the end of the Afghanistan war al-Qaeda from which ISIS and Al-Nusra derive, was created. Bin Laden (an Afghan war veteran) together with these Mujahideen fundamentalists joined to create a new organization that vowed to impose their radical sunni (wahhabi) ideology through fear and terror. Not all Mujahideen (synonym for jihadist) combatants engaged in al-Qaeda of course although many did. They contributed to the development of the terrorist organization as they had extensive combat experience, access to high-quality weapons provided by the US and what is worse, they were bigoted sadists who wanted to kill at all costs. This is a highly recommendable article by Robert F. Kennedy on how the US installed their personal dictators through the CIA in middle east countries like Syria or Jordan to serve their interests. Here is a video of a US general talking about the US plans to take down 7 countries in 5 years (the majority Middle East countries). Here are a couple of great books on the history of the CIA and specially this one on the CIA, Afghanistan war and its consequences. Here is the report  made by the UK Parliament on western intervention in Lybia, as you can guess, based on lies. Not the answer you're looking for? Browse other questions tagged united-states politics isis .